Repair, renovate, restore, replace, replicate. You repair a broken piece of furniture to continue using it. You renovate a kitchen to remove old appliances, flooring, cabinets and light fixtures and replace them with more modern or higher-quality selections. You restore a classic automobile so you can drive it again, proudly. You replace a favorite old jacket that has become frayed and worn out. 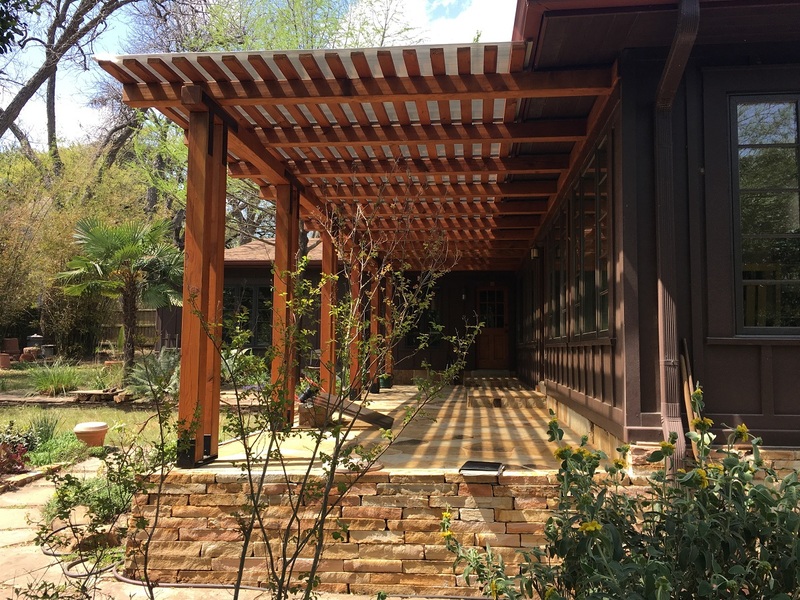 In Downtown Austin, you replicate a dearly-loved pergola when it has finally deteriorated beyond repair. Archadeck of Austin accepted the challenge. . Our attention to detail and woodworking skills served us well on this project. 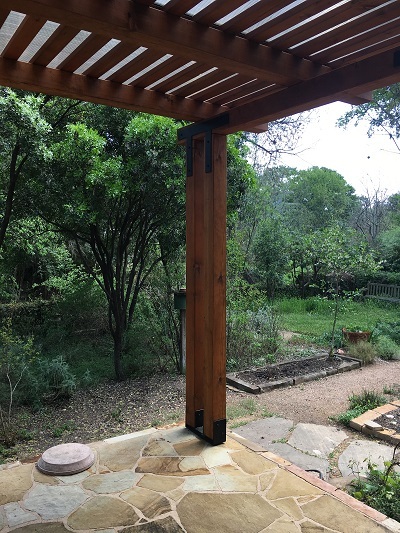 We custom-designed iron post bases to support and elevate double posts spaced such that the rafter sat right between the posts. Metal braces were used to provide lateral bracing, avoiding angular braces. All the metal was powder coated to avoid any chance of rust, scratching and wearing. We decided to use 2×4 slats laid flat with more than normal spacing to simplify the lines, and all the wood was Douglas fir, chosen for the beauty and tightness of the grain. All the edges were smoothed over with a router bit, to eliminate sharp edges. Finally, we added the Polygal cover over the pergola to increase the amount of shade provided, and we cleaned and resealed the flagstone patio. The Polygal cover filters out the sun’s UV rays and absorbs heat, keeping the patio cooler, increases the amount of time the homeowners can spend outdoors comfortably, and keep water off the wood dramatically increasing its life expectancy. The flagstone patio looks like new again. 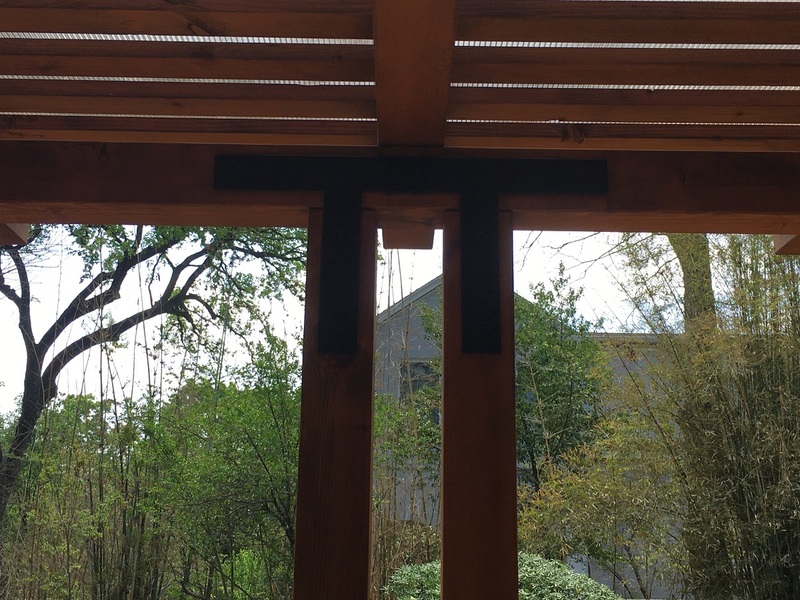 Every detail mattered, and they came together beautifully under the skillful hands of our craftsmen to achieve the desired result: the new pergola looks just like the original one. The homeowners are thrilled with the replication of their much-loved pergola. 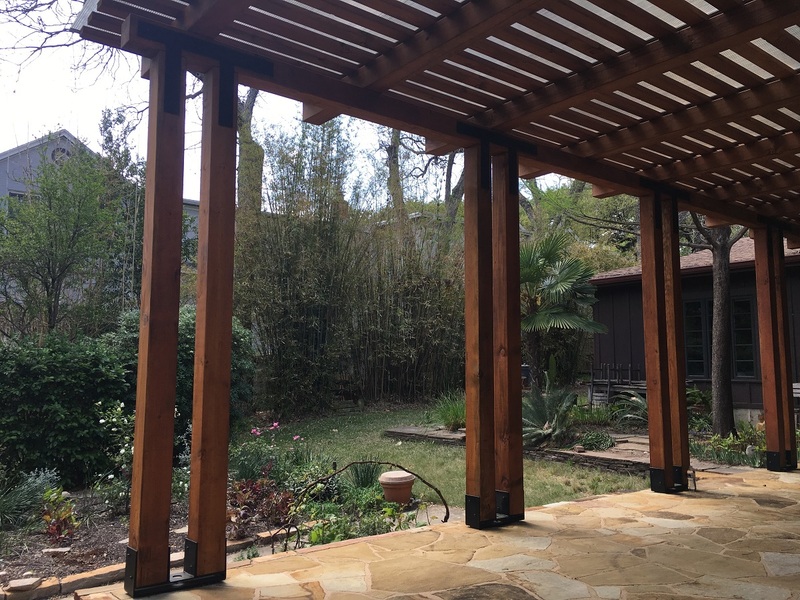 If you would like a custom-designed pergola or any other kind of outdoor living structure, contact Archadeck of Austin today at (512) 259-8282 or via email at [email protected] to schedule a free design consultation.